Potential residents looking for luxury real estate outside of Downtown Atlanta will surely be drawn to the neighborhood of Mt. Paran – Northside, a prestigious vicinity in the northern Buckhead region. As one of the most expensive suburbs in Buckhead to purchase a home, the vicinity is surrounded by colorful gardens, well-maintained lawns and wooded lots, providing residents with privacy and close proximity to the heart of Downtown. Additionally, the suburb is home to many successful professionals, influential business leaders and other high-income professionals and their families. For instance, the median household income in Mt. Paran is $155,252, with 47 percent of residents earning more than $150k per year. Moreover, most homes in Mt. Paran are occupied by older adults and children younger than 17 years of age. For instance, 24 percent of properties are occupied by children 17 years of age and younger, while 18 percent of residents are 65 years of age or older. About 16 percent of residents are between 55 and 64 years of age, while 15 percent are between 45 and 54 years of age. However, the neighborhood is not ideal for millennials and younger adults, as only 13 percent of residents are between 18 and 34 years of age. Since most homes for sale in Mt. Paran are worth around $952,244 or more, residents tend to be older and further along in their careers. For instance, many luxury homes in Mt. Paran are the former properties of well-renowned CEOs, business legends and top executives. Additionally, about 86 percent of residents hold bachelor’s, master’s or higher degrees. As for popular styles of houses in Mt. Paran, most are large estates with up to 15,000 square feet of living space, or more. A mansion in Mt. Paran may come with pool access and other desirable amenities, such as media rooms, wine cellars, wet bars and five or more bedrooms and bathrooms. Modern, unique or contemporary homes are also found in this elite Atlanta neighborhood, many of which have been featured in television commercials and magazines. While owner financed homes account for 69 percent of all real estate in Mt. Paran, 31 percent of structures are rented. Additionally, the median monthly cost of rent in the vicinity is $1,236, with 38 percent of rentals averaging between $1000 a month and $1,499 per month. While single family houses are the most common types of properties in the neighborhood, other parts of the Buckhead area feature a variety of high-rise housing complexes. For instance, luxury apartments may be rented outside of Mt. Paran in nearby neighborhoods such as Whitewater Creek, Randall Mill, West Paces Ferry and Chastain Park. 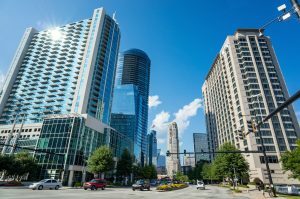 High-rise rentals may be available at the local Bell Buckhead West, The Reserve at West Places, The Rocca, Post Riverside, Jewish Tower and Overton Rise. Located within the perimeter of Interstate 285 (I-285) and just outside of the Atlanta beltline, the neighborhood of Mt. Paran is also in close proximity to a variety of popular attractions, including Chastain Park, Whitewater Trail National Park, Shedd Manning Gallery, the Punchline Comedy Club, the Atlanta History Center and the AMC Dine-in Buckhead 6 Theatre. Additionally, local restaurants include OK Café, Pero’s Pizza and Pasta, La Grotta Ristorante, Café Vendome, Houston’s, Heirloom Market, Henri’s Bakery, Northcreek Café, Horseradish Grill, Blue Ridge Grill, Canoe and Food 101. As for shopping in the suburb of Mt. Paran, area retailers include Trader Joe’s, Barnes & Noble Booksellers, The Home Depot, Atlanta Cycling, Smith Ace Hardware and the Mt. Paran Country Store. Nearby shopping centers include the Cumberland Mall, Paces Ferry Plaza, The Battery Atlanta, Fountain Oaks and Vinings Jubilee. While public transportation is provided by the Metropolitan Atlanta Rapid Transit Authority (MARTA), the closest bus stops are still a short walk from most homes in the neighborhood. For instance, MARTA Bus Route 12 for Howell Mill Road/Cumberland has several stops along Northside Parkway Northwest, while Bus Route 5 for Piedmont Avenue/Sandy Springs has several stops along Roswell Road Northeast. Additionally, the neighborhood is not as walkable or bikeable as other Atlanta neighborhoods, as its biking and walking score is just six out of 100. Heards Ferry Elementary – With a student-to-teacher ratio of 16 to 1, the school serves preschoolers, kindergarteners and first through fifth graders. Sutton Middle School – With a student-to-teacher ratio of 17 to 1, the public school serves grades 6 through 8. North Atlanta High School – With 1,734 current enrollees and a student-to-teacher ratio of 17 to 1, the high school serves grades 9 through 12. The Main Street Lower Academy – Serving grades K through 8, the school has a student-to-teacher ratio of 26 to 1. Riverwood International Charter School – As one of the top public high schools in Georgia, the charter school serves grades 9 through 12. Jackson Elementary School – With a student to teacher ratio of 16 to 1, the top-rated school serves grades K through 5. As for age and racial diversity within the perimeter of Mt. Paran, about 81 percent of residents are white, 8 percent are Asian, 5 percent are Hispanic and 4 percent are African-American. About 56 percent of residents are female, while 46 percent are male. Moreover, Mt. Paran is the 14th-safest neighborhood in Atlanta, and the 26th-best vicinity in Atlanta in which to raise a family. With help from the Mt. Paran – Northside Citizen’s Association and off-duty police officers who regularly patrol the area, the neighborhood is protected from serious instances of property crime and violent crime.